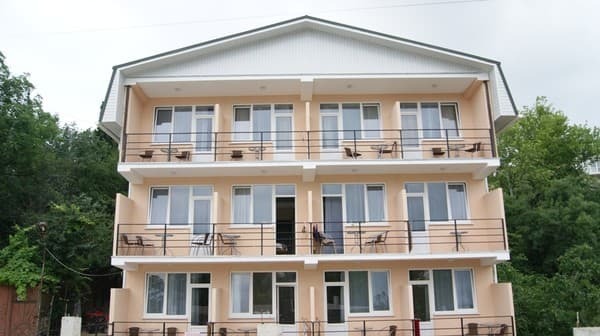 Private mini hotel "Nice" is located in a quiet area of ​​Yalta, in close proximity to the center (15 minutes walk), 800 meters from the famous Yalta Embankment. 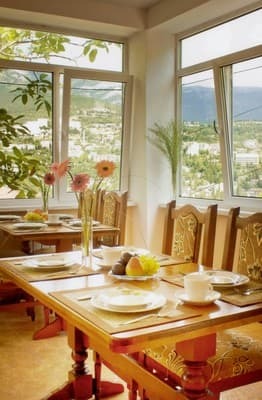 From the hotel windows you can see a beautiful view of the mountains and Yalta. 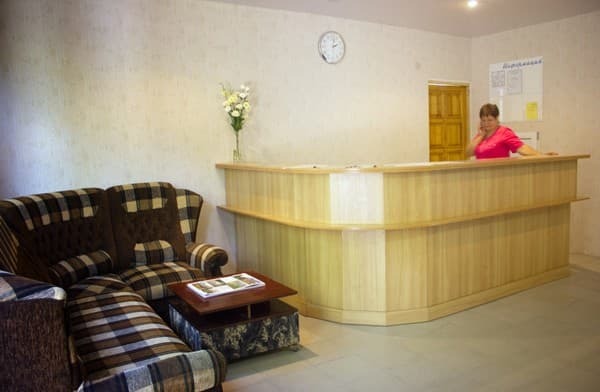 For accommodation are offered 19 comfortable rooms with all amenities: flat screen TV, refrigerator, electric kettle, free Wi-Fi, bathroom. The cafe on the territory of the hotel "Nice" will please the guests with delicious homemade cuisine. The price includes 2 meals a day. On the Yalta embankment there is a free beach "Primorsky". Yalta Bus Station is 5 km from the hotel. 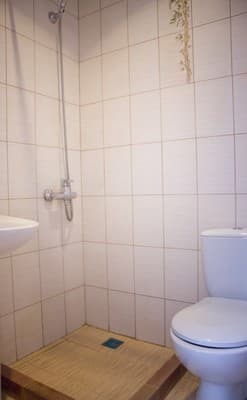 The distance to the railway station and the international airport of Simferopol is 100 km. PRICES ON THE SITE ARE AVAILABLE AT THE COURSE 10.03.15 (0.36). The cost may vary, depending on the course, it is necessary to obtain information about the operator. 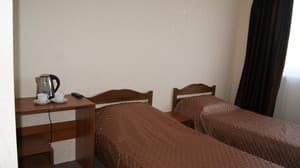 Description of the room: Double or two single beds, wardrobe, TV, refrigerator, electric kettle. Description of the room: Cozy room with a magnificent view of the mountains. The room has two single beds, wardrobe, TV, refrigerator, electric kettle. Children under 5 years stay free of charge without extra beds. Additional place - eu-clamshell, the cost of accommodation to specify when booking. 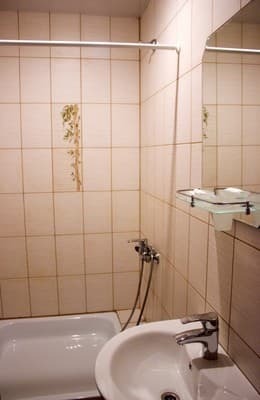 Hotel "Nice" is located in a quiet area of ​​Yalta, in close proximity to the center (15 minutes walk), 800 meters from the famous Yalta Embankment (small rise). Yalta Bus Station is 5 km from the hotel. The distance to the railway station and the international airport of Simferopol is 100 km. From Simferopol by bus or trolleybus No. 52 to Yalta, then from the bus station by route № 11, 35 to the stop "Colonnade". Then climb up the street Shcherbaka. Either by shuttle bus number 19 to the stop "Tea Hill", then go down Scherbak Street to the club-dining room of the Sanatorium. V.V. Kuibyshev. The cost of a taxi from 30 to 50 UAH.